Yes! Spring is coming again. That means that the sun is going to take a look again, and the shorter shorts could be taken out of the closet. Really lovely time of the year! I did a pair of Vans shoes before, those were the Atwoods as I remember? I plan to do a pair every year, so I could walk out with a fresh pair of Vans every summer. Those 'Atwoods' were so filthy, they weren't what I expected in any way. The idea I got when started painting the shoes was fainted when I was finished.. Meh. They are not bad, nowadays they are still wearable - with the paint on after a rough 20 rainstorms. Good for piecing at a legal wall from now on, but not for the more serious things.. Cleaning your closets always give you surprises. 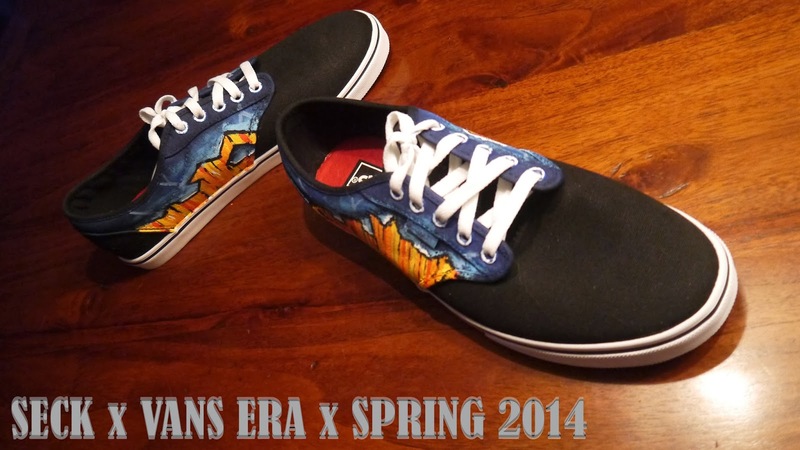 I don't have the budget right now for new fancy boots, so I was really enlightened when I found these Vans Era's. I really wanted to do a pair with a 'canyon edge' like surface, like it was about to break off. So I made a comic book / Marvel style edge break-off with a lil' Seck change. Enjoy!